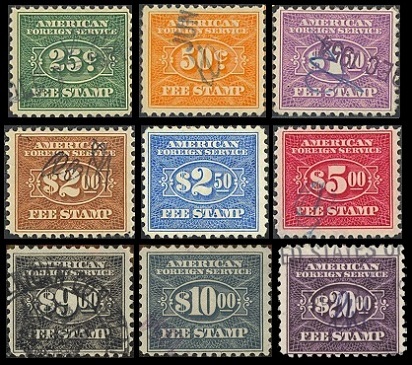 US revenue stamps for the collection of consular service fees were first issued in 1906. 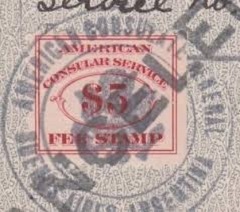 The Act of Congress effective June 1, 1906 stipulated that consular officers must be provided with Consular Service Fees stamps, with their printed denominations to be determined by the US Department of State. These Consular Service Fees US revenue stamps were required on every document for which a consular fee was charged, as evidence of the payment of that fee. 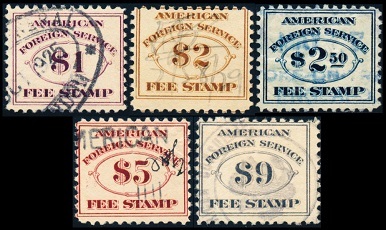 The eight major type Consular Service Fees stamps shown above were issued during 1906. Each of these stamps is inscribed "CONSULAR SERVICE". 25 C. (1906 - Sc. #RK1) - Dark Green. 50 C. (1906 - Sc. #RK2) - Carmine. 01.00 D. (1906 - Sc. #RK3) - Dark Violet. 02.00 D. (1906 - Sc. #RK4) - Brown. 02.50 D. (1906 - Sc. #RK5) - Dark Blue. 05.00 D. (1906 - Sc. #RK6) - Brown Red. 10.00 D. (1906 - Sc. #RK7) - Orange. 25 C. (1906 - Sc. #RK8) - Dark Green. 50 C. (1906 - Sc. #RK9) - Carmine. 01.00 D. (1906 - Sc. #RK10) - Dark Violet. 02.00 D. (1906 - Sc. #RK11) - Brown. 02.50 D. (1906 - Sc. #RK12) - Dark Blue. 05.00 D. (1906 - Sc. #RK13) - Brown Red. 25 C. (1906 - Sc. #RK14) - Dark Green. 50 C. (1906 - Sc. #RK15) - Carmine. 01.00 D. (1906 - Sc. #RK16) - Dark Violet. 02.00 D. (1906 - Sc. #RK17) - Brown. 02.50 D. (1906 - Sc. #RK18) - Dark Blue. 05.00 D. (1906 - Sc. #RK19) - Brown Red. 09.00 D. (1906 - Sc. #RK20) - Gray. 10.00 D. (1906 - Sc. #RK21) - Orange. 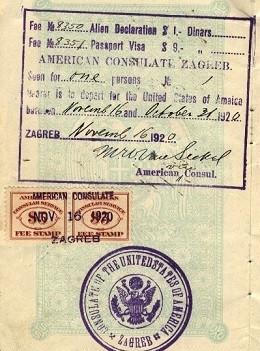 The five Consular Service Fees stamps shown above were issued during 1924. Each of these stamps is inscribed "FOREIGN SERVICE", and they are all perforated 11. 01.00 D. (1924 - Sc. #RK22) - Violet. 02.00 D. (1924 - Sc. #RK23) - Brown. 02.50 D. (1906 - Sc. #RK24) - Blue. 05.00 D. (1924 - Sc. #RK25) - Brown Red. 09.00 D. (1924 - Sc. #RK26) - Gray. The nine re-designed Consular Service Fees stamps shown above were issued between 1925 and 1952. These stamps are also inscribed "FOREIGN SERVICE". 01.00 D. (1925 - Sc. #RK27) - Violet. 02.00 D. (1925 - Sc. #RK28) - Brown. 02.50 D. (1925 - Sc. #RK29) - Ultramarine. 05.00 D. (1925 - Sc. #RK30) - Carmine. 09.00 D. (1925 - Sc. #RK31) - Gray. 25 C. (1937 - Sc. #RK32) - Green. 50 C. (1934 - Sc. #RK33) - Orange. 01.00 D. (1925 - Sc. #RK34) - Violet. 02.00 D. (1925 - Sc. #RK35) - Brown. 02.50 D. (1925 - Sc. #RK36) - Blue, Ultramarine. 05.00 D. (1925 - Sc. #RK37) - Carmine. 09.00 D. (1925 - Sc. #RK38) - Gray. 10.00 D. (1939 - Sc. #RK39) - Blue Gray. 20.00 D. (1952 - Sc. #RK40) - Violet. The use of Consular Service Fees US revenue stamps was discontinued on September 30, 1955.